Bali Rafting Ubud Tour are combination activity of Bali Rafting at Ayung River and Ubud Village Tour. On Bali Rafting Ubud Tour you will be visiting the Ayung River for Rafting and place of interest and tourist destination in Ubud area after the rafting such as : Ubud Monkey Forest, Ubud Royal Palace, and Ubud Market in the center of Ubud Village. 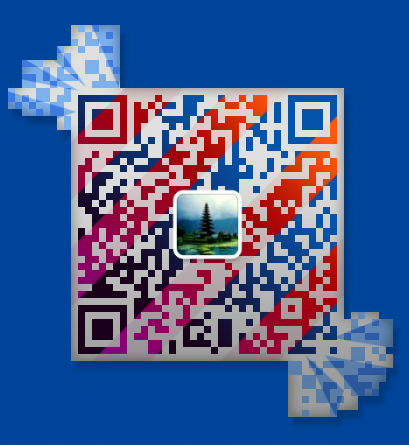 Our professional and hospitality driver will handling and take you to enjoy the trip. 08.00 – Pick Up at Hotel. 09.30 – Arrive at Rafting start point. 13.00 – Finish rafting and have lunch. 14.30 – Visiting Ubud Royal Palace. 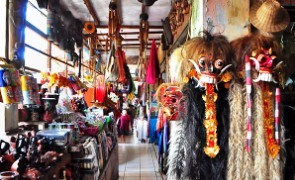 14.45 – Visiting Ubud Market. 16.30 – Back to hotel. Enjoy the bumpy jump, sliding and feel the nature surrounding the valley at Ayung River. Professionally trained and experienced guides pilot safety-equipped and Avon rafts through the best river runs. The Ubud Royal Palace is one of the most prominent places in Ubud, as it is smack-dab on the main Jalan Raya Ubud road and intersection. The palace can also be regarded as the focal landmark of Ubud. The Ubud palace was built during the lordship of the late Ida Tjokorda Putu Kandel (1800-1823), and is well-kept by his successive heirs. A visit to the Puri Saren is on many of the itineraries to the Ubud area. 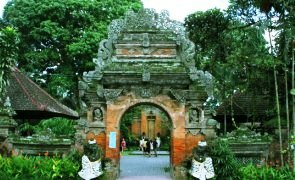 It has well-preserved Balinese architecture and charming garden settings, and is best known among lovers of Balinese arts as one of the main sites to view dramatic evening dance performances. The Ubud Monkey Forest is a nature reserve and Hindu temple complex in Ubud, Bali, Indonesia. Its official name is the Sacred Monkey Forest Sanctuary (Balinese Mandala Suci Wenara Wana), and its name as written on its welcome sign is the Padangtegal Mandala Wisata Wanara Wana Sacred Monkey Forest Sanctuary. 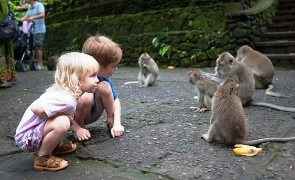 The Ubud Monkey Forest is a popular tourist attraction and is often visited by over 10,000 tourists a month. The Monkey Forest lies within the village of Padangtegal, which owns it. The village’s residents view the Monkey Forest as an important spiritual, economic, educational, and conservation center for the village. Inclusion : Private Hotel return transfer (No join), English speaking driver, Petrol, Lunch, 2 hours Rafting, Entrance fee at tourism site, Parking fee, Rafting Insurance coverage. 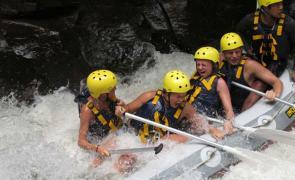 This entry was posted in Bali Rafting, Tour Packages and tagged Bali Rafting, bali tour, Ubud Tour. Bookmark the permalink.